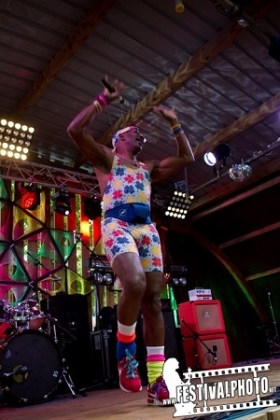 On the woodland stage, TV fitness legend Mr Motivator was doing an exercise session. Kicking off around midday I wasn't sure how many people would turn up, but I wasnt expecting the sort of crowd that was in front of the stage when I arrived. Mr Motivator had a big crowd, and they werent just watching - there must have been a couple of hundred people following his instructions for the workout. It's an unusual sight at a festival but having Mr Motivator there was clearly a popular choice. Over on the main stage I was expecting to see New Town Kings, but instead it was a band called Electric River. Sadly I only caught the last few minutes of their set but what I heard sounded good. Back to the planet were next and had a very good crowd for an early slot on the bill. Their ska-punk sound was great and was just what any tired festival-goers needed to wake them up properly. Before the next band came the World Record attempt to get the most people in one place wearing false beards. I'm not sure if they managed it or not but there were a lot of people in false beards visible from the stage, and a lot in fancy dress too. Mr Motivator was the judge to pick the best fancy dress with the winner being a man with a lego beard who won tickets for next year's event. Itch was next up but as his music really didnt appeal to me in the slightest, I headed off to look around the site and to photograph some of the many people in fancy dress. I got to see several people in pirate ships spot each other and stage a battle before heading off in different directions. At most festivals that would be a strange sight, but at Bearded Theory it just seems normal. Mad professor & the robotiks came next with some Dub reggae. To provide some visual entertainment they had two dancers in colourful outfits. I really enjoyed the music - definitely enjoyable stuff. The beat came next with their frontman Ranking Roger being one of the most energetic people on the stage all day - he was constantly racing around as he sang. The Beat are one of those bands I remember from my youth but who I never expected to see live. They certainly didnt disappoint and put in a superb set that appealed to lovers of ska and reggae (and good music in general). Misty in roots came next giving Reggae fans a real treat. One of the most influential and political British reggae bands their set really is fantastic and a is one of many highlights of the festival for me. Then came another legendary band from the 70s - Buzzcocks. They've got one of the most recognisable band names around, whether you're a fan of theirs or not, the chances are you've hear of the BBC TV show "Never mind the Buzzcocks" (which has recently been announced as ending). Tonight the band show that they aren't just part of a TV show name - they still know how to play some great pop-punk. It's a great set, and comign between a Reggae band and an Indie rock band they demonstrate the diverse lineup of Bearded Theory. A great set. Finally it was time for James. They seemed an odd choice as headliner for Bearded Theory, but since the diversity of acts is one of the things that appeals to many people then I was curious to see how popular they'd be. As it turns out, a lot of people came to see them and there was a large crowd by the time they took to the stage. Normally with a band that has one massive hit single, you can guarantee it will be the last song they play, so I was caught by surprise when James opened with their hit "Sit down". It turned out to be a stroke of genius as a crowd that was probably largely curious to see what the band were like, were suddenly presented with a song they knew and could sing along to, so James got them on side right from the start. 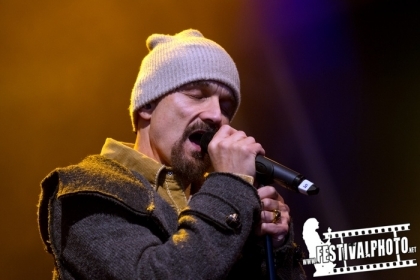 It's not long before lead singer Tim Booth climbs down from the stage and comes and stands at the barrier to get up close and personal with the fans. With a mix of old and new songs it's a very good set and shows why they were booked as a headliner. A very good end to a great festival. So overall, how did I find this year's event? Well, the organisation was excellent with the exception of the car parking which was poorly run - they need stewards there till after the headline acts finish as many fans travel daily, so for them to return to the car park and find nobody to direct them and to find all the exits shut is not good enough. Other than that, things ran very smoothly - the site was well laid out with only minor changes made to the previous year to improve things. The stewards were all friendly and helpful and security was low key. Food stalls were very good as always - plenty of choice and the quality of the food I had was very good. Above all though, the atmosphere was excellent - it's a really friendly festival with a great atmosphere and that is a large part of what makes it so enjoyable. Kids were well catered for with plenty of free activities available for them. Many festivals have poor bars - either serving mass produced lager and cider and no ales, or limiting ales to a VIP area, but Bearded Theory have teamed up with Thornbridge brewery again to run the bars so there is an excellent selection of real ales available including a specially brewed festival ale (which tasted delicious). The highlight of the beer tent though had to be the "Cocoa wonderland" beer - a chocolate beer that not only smelt delicious but tasted great too. Very very drinkable. The fire show was fantastic to see but it's a shame it was only on once and wasnt publicised so most people didn't know it was going to happen. Hopefully it will be back next year and have times advertised in the program. Bearded Theory is a festival I can't recommend highly enough - it's family friendly, has a great atmosphere, a great diverse selection of bands and is simply a fantastic weekend.